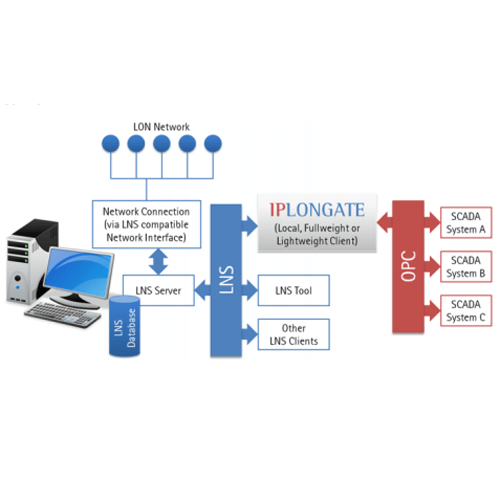 IPLONGATE is a software gateway for LON networks. It serves as a high-performance connection of visualisation systems to a LON network based on LNS. 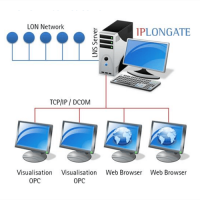 IPLONGATE primarily fulfils the requirements of major building automation systems with complex network architecture and provides OPC® as a standardised interface for this. In addition a web server is also integrated in IPLONGATE. LON® OPC® Server and Web Server for LNS® 3.x, OpenLNS (LNS 4.0) and IzoT (LNS 4.1). The functionality of the trial version is the same as IPLONGATE Premium and there is no limitation of the number of network variables or configuration properties. Using the trial version IPLONGATE automatically shuts down after 8 hours. LON® OPC® Server and Web Server for LNS® 3.x OpenLNS (LNS 4.0) and IzoT (LNS 4.1). Access to a maximum of 150 data points. LON® OPC® Server and Web Server for LNS® 3.x, OpenLNS (LNS 4.0) and IzoT (LNS 4.1). Access to a maximum of 11,800 data points.